People who apply makeup professionally are called makeup artists. They deserve the title “artist,” because they play with colors to enhance and highlight your natural beauty, a hairdresser does the exact same. It is true that both makeup artists and hairdressers work off the same color wheel yet the makeup artist has an easier job when learning the trade because with a little cleanser and water the makeup comes off when it’s not a desired result, not so easy for the hairdresser .There are many theories on how to select your colors in makeup and hair and all have their own unique points. For me as a hair color specialist my theory is whether its makeup or hair color we need to apply both cool and warm tones on any individual, each compliments each other when placed correctly beside or on top of each other this is how we balance. The fact is; all human beings are made up of many tones; take for an example a pale (cool) skinned brunette (warm) with blue eyes (cool), she’s warm and cool just how Mother Nature made all of us. My beliefs is for all hairdressers and makeup artists to learn the most important basic fundamentals in each respectful domains, and both will realize makeup and hair color can draw ideas from each other, enhance and highlight the same features, eye color, skin tone, bone structure, hair because they both work off the universal color wheel. I have had the honour of working with some of the world’s best and finest makeup artist and have learnt many things and tricks; makeup has been an insightful learning element in my career as a hair colorist. 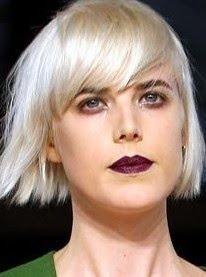 Makeup artists as well as a hairdresser sometimes use the same techniques (makeup layers and blends so does hair color. Now can you imagine you the consumers going to a hairdresser who offers you to finish your visit with a change of lip and or a blush color after your new or freshened up hair color, nice huh!.Still to this day I love working with makeup artists and doing a little makeup on my clients, after all if I am sending someone home after a change to their hair color with the same makeup they came in with truly my job isn’t finished and when makeup connects to hair color it works in harmony for the ultimate end result to achieve individual beauty. can i come work with you? I'll hold your brushes hehehe great blog! !